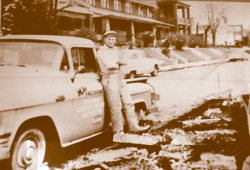 MICHAEL FACCHIANO CONTRACTING, INC., a family owned business, was established in 1956 by Michael Facchiano, Sr., located on McNeilly Road in the South Hills area of Pittsburgh, Allegheny County, Pennsylvania. Now into its third generation of family members, the tradition of Pride in Workmanship and a Job well-done continues on. From starting with a pickup and a hand full of tools, and a strong desire to build a business, Mr. Facchiano and his family have continued to build and grow their reputation in the Heavy, Highway, Utility and General Contractor Industries. We look forward to being of service to you and addressing your various construction needs.